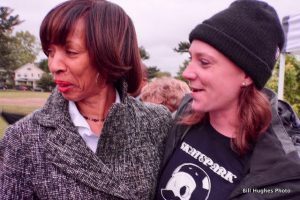 Baltimore Mayor Catherine Pugh, celebrated the official opening Saturday with ribbon cutting and all – of “Skatepark Phase Two,” in Hampden (Hon). It is located in Roosevelt Park, at 1201 W. 36th Street. Mayor Pugh was introduced at the gala event by Ms. Stephanie Murdock. She is the founder and President of “Skateboard of Baltimore.” In her remarks, the Mayor praised Ms. Murdock for her tenacity in bringing the project to completion. She also acknowledged the solid backing from the elected officials on both the city and state levels. Pugh celebrates opening of Skatepark. The program also listed over 40 sponsors and individuals who contributed to the “grand opening” festivities.” Many are local businesses who are located on or near “The Avenue,” aka 36th Street, and/or on Falls Road. Music, food and drinks were available for the festivities. Live music from six different groups was also on the agenda from 12 noon to 7: 45pm. And, of course, there were folks there selling – skateboards! Some of the local politicos listed as speakers, in addition to Her Honor the Mayor, were: Councilwoman Mary Pat Clarke, Councilman Kristerfer Burnett, Delegate Nick Mosby, Sen. Barbara Robison, Del. Antonio Hayes; along with Councilmen Zeke Cohen, Ryan Dorsey, Leon Pinkett and Eric Costello. Learn more details on the website about Skateboard of Baltimore’s history. Mayor Pugh’s remarks can be be found at https://vimeo.com/217329314.